According to Chinese legend, silk was first discovered in 2640 BC by XiLingJi, the fourteen year old wife of China's third Emperor -the so called "HuangDi". It is said that XiLingJi was having tea beneath a mulberry tree in the palace gardens, when a cocoon fell from the tree into her cup of hot tea. She and her handmaidens were astonished to see the cocoon start to unravel, revealing a long delicate thread. XiLingJi was so delighted by its beauty and strength that she collected thousands of cocoons and then wove them into a robe for the Emperor. Silk has been regarded by the Chinese as the ultimate luxurious cloth for over 4000 years. Originally only the Emperor could wear it. Later high officials at court were granted the privilege. As production techniques improved, so its usage spread.It was once be used as currency due to its high value. China started to trade silk westwards when the trading route we now call The Silk Road opened in the 2nd Century AD. 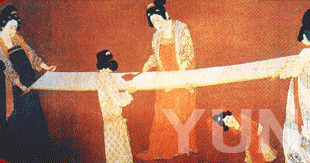 The secret of how to make silk was successfully kept on pain of death in China for nigh on 2500 years. Eventually it got out to Khotan, an oasis just north of the Tibetan Plain, in the 5th century. A Chinese princess was betrothed to the King of Khotan. She smuggled cocoons and mulberry seeds in her headdress. Around 550 AD, it is said that two Christian monks successfully smuggled cocoons in their bamboo walking staffs back from Khotan to Constantinople. They had been commissioned to the task by Emperor Justinian of Byzantium. The secret, or techniques, of silk production only spread further west some 700 years later. France and Italy were the leading European manufacturers by the 15th century. Some of the Huguenots, having fled France and Flanders, set up a silk weaving complex at Spitalfields in London in the 1620s. Silkworms, being flightless, are totally reliant on highly skilled humans, and are therefore extremely labour-intensive. 1 Kg of silk is produced by 6000 silkworms, after consuming 200 Kg of mulberry leaves. A filament from a silkworm can be over a mile long; although half a mile is more normal. Between 5 and 8 of these filaments are twisted together to make a thread. Today silk is grown mainly in Asia, with China steadily regaining her traditional major market share by increasing production. The demand for silk has increased steadily over time, despite the inroads made by much cheaper man-made fibres. The fact is that people prefer silk over almost any other fibre when circumstances allow. As prosperity spreads, so does the demand for silk. Many layers of Long Silk floss are pulled out by hand to the dimensions of the duvet until the right weight is reached to reflect the correct Tog Value. Each layer takes on the appearance of gossamer as it is stretched out. This is why Long Silk cannot bunch up inside the duvet and remains evenly distributed throughout its life.